It has been about a month since I told you all in a recent blog post about all we had going on in June. There were milestones to be celebrated, a fun vacation, and a little moving. I was a little nervous because everything was packed tightly into such a short period of time. My hope was that everything would go as planned and we could enjoy each event with ease. Well...it didn't go as planned and we had one major hitch that affected almost every bit of all we had going on. The day before my son's graduation, he woke up with a sore throat. He immediately told me the bad news and I was not happy. We had family coming from out of state that day, a party planned for celebrating his graduation, and knowing we were just 6 days away from Disneyland, this was the last thing I wanted to hear. I wanted my son to be feeling his best, not wanting anyone else to get sick, and I just didn't have time to be dealing with an illness. But there are some things in life we just can't control and this little sore throat would soon turn into a huge problem. Graduation morning, my son woke up feeling worse. We had been trying everything to bring healing: oregano oil, sea salt gargles, herbal tea, bone broth, essential oils, elderberry, you name it, we were trying it. So it was quite discouraging that we made no progress as we usually do. His special day was here and he was feeling miserable. He plowed through the day like a trooper and we managed to focus on his success rather than the uncertainty of his health. The following morning there was no improvement. So off to the doctor we went. There we got the lovely diagnosis of strep throat. He had been to a Silversun Pickups concert three days prior, so my guess is that is probably where he came in contact with strep. One last little gift from college and it was a doozy! You may be thinking, no biggie, just give the kid some penicillin and all is good, right? I wish! He is allergic to penicillin. Soooo, then we played the game of which antibiotic will actually work for him. The doctor prescribed Z-pack and told us in a couple of days he will be feeling much better. We only had 3 days until we left for Disneyland, so this news was super stressful. The next two days that followed showed no improvement, although my son would tell us otherwise. I think he was just trying to think positively that he was getting better. His lack of food and proper hydration clouded his judgement as he literally could not eat or drink. It was awful! My husband felt like we needed to cancel our trip. But the rest of us had our hearts set on going. We ignored his suggestion and just kept thinking everything would work out. The morning of our departure came and my son was still hurting and weak. He assured us he was feeling a little better and if I would have been looking at the situation differently, I would have clearly seen he was not better at all! The flight really took a toll on his ears and just made everything worse. By the time we arrived in CA, my son had developed a fever and chills. I immediately called the doctor and explained that we needed a different medication. They assured me we just needed to give it a few more days. I wanted to scream! We do not have a few more days! Things just progressively got worse and we ended up taking our son to the ER that evening. We got right in...no one waiting in front of us! That was a gift. The doctor then told us the antibiotic wasn't working (duh!) and he prescribed a new one. My son also received a shot of a heavy duty pain killer which helped him to gulp down a much needed bottle of water. We went back to our hotel and prayed for a miracle the next morning. When morning came, I ran over to the boys' hotel room to see what the status was. Unfortunately, it was not a good report. The pain killer had worn off and my son was pretty much in the same state as he was when we landed the day prior. It just hadn't been enough time for the new medication to kick in. The decision was then made that we needed to fly home. It was so disappointing to all of us as we had been looking forward to celebrating his accomplishment as we sported some Mickey ears. My husband managed to get us the last four seats on a non-stop flight home and by that evening, we were back in Oregon. The day after we arrived back at home proved to be a rough one for me. Not only was I feeling horrible that my son's celebration did not go as planned, but I was also throwing myself a pity party. I kept thinking about how we were supposed to be riding rides, laughing, and building family memories. Instead, I was at home, doing laundry, cleaning, cooking, and taking care of a sick person. All the planning, organizing, and built up excitement all for nothing. Talk about a kick in the gut! I pouted the whole day. Then my thoughtful husband wanted to take me out for dinner to try and cheer me up. I reluctantly went, even though I had been fighting back tears the entire day and was a complete grouch. I'm sure he felt helpless as he tried to bring my smile back. That is until he said would take us back to Disneyland in the fall. That put a sparkle back into my eyes and a smile on my face. I love second chances! Don't you? It appears we will be donning those Mickey ears after all! Not only does my son deserve it, but we all do after what we went through. Now our goal was to get our son healthy before he left for his internship. He had lost almost 15 pounds as he was not able to swallow a thing! We only had 6 days to get him well. Each day he got better and stronger. The day came to move him to his summer home and he was feeling great! The move went smooth and we got him settled into his new place. It was so hard to say goodbye the next day knowing it would be almost 3 months before I would see him again. When my husband and I drove off, I stared at him through my rear view mirror. I watched him open his apartment door and walk in. Tears filled my eyes and I got that "lump in your throat" feeling. I knew I would miss him greatly. He is an awesome kid! I also just hoped this would be an incredible experience for him. I have cried more in the past 3 weeks than I have in the past 3 years due to a gamut of emotions. Happy, sad, frustrated, proud- there have been many highs and lows. I'm thrilled to report that he is doing well and loving his work as a journalist and at the newspaper. He has already had a few articles published with more on the way. My son has been so good about keeping in touch which helps me tremendously. Even though things did not go as we hoped or planned, it all eventually worked out and his health was restored. This was yet another reminder of how important our health is and should not be taken for granted. Here is our last breakfast before we parted ways. 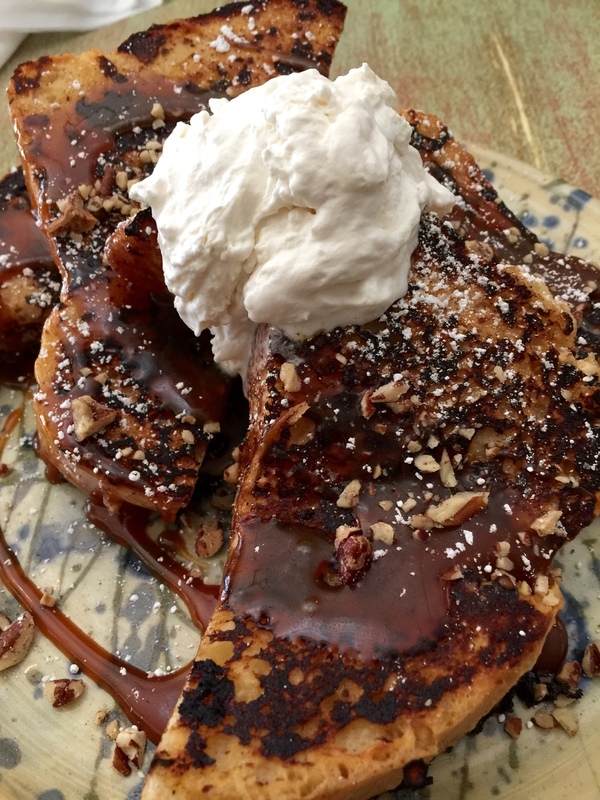 He enjoyed some french toast drizzled with caramel- it was amazing! In honor of my son, I wanted to share with you one of his favorite treats. He has always loved zucchini bread. Over the years I have managed to create a healthier version than the typical loaf that is full of refined sugar. Creating a cinnamon swirl center is a flavorful spin on a traditional loaf. This is easily accomplished by setting aside a portion of batter and mixing in cinnamon and maple syrup. This batter will be a middle layer between the regular batter. Use a knife to make circular motions from the bottom of the pan to the top. Summer time is perfect for enjoying a loaf of zucchini bread. You are using zucchini when it is at its finest! Your local farmer's market is the place to score this bright green summer squash. Packed with vitamin C, zucchini provides powerful antioxidants and anti-inflammatory benefits. This cinnamon swirl zucchini bread is the perfect treat for even the pickiest eaters. Using a small amount of maple syrup provides the right amount of subtle sweetness while the flavors of zucchini, cinnamon, and almond provide the right blend of healthful satisfaction. 1. Preheat your oven to 350°F and line a loaf pan with parchment paper. 2. Mix the almond flour, baking soda, sea salt, and 1/2 tsp cinnamon, ginger, and nutmeg in a large bowl. 3. In a smaller bowl, mix the eggs, 1/4 cup maple syrup, and 1/3 cup coconut milk. Then add the zucchini to the wet ingredients. 4. Combine the wet and dry ingredients. Set aside 1/2 cup of batter to prepare the cinnamon swirl. Add 2 tsp cinnamon and 3 Tbs maple syrup to the 1/2 cup batter. Mix well. Then pour 1/4 of the regular batter into your loaf pan. Evenly spread 1/2 cup of cinnamon swirl batter over that. Then add the remaining batter. Using a knife, start at one end of the loaf and move the knife from the bottom of the batter in the loaf pan to an upward circular motion that reaches to the top of the loaf to create a swirl. Do this from one end to the other. Then smooth out the top layer of batter before baking it. 5. Place the loaf pan in your oven and bake for 50 minutes, or until a toothpick comes out clean. Cool, slice and enjoy!